No LGBT person has ever moderated a presidential or vice presidential debate in the general election. 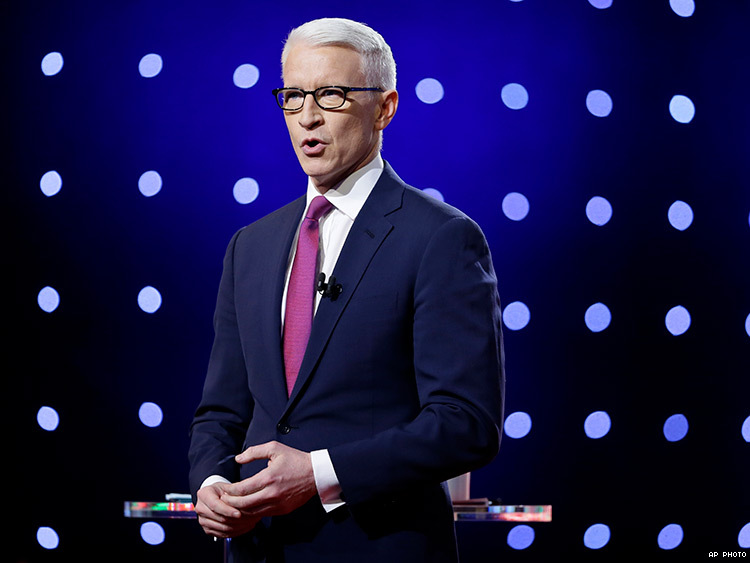 Anderson Cooper is the first out gay man entrusted with hosting a presidential debate in the general election. The Commission on Presidential Debates today announced Cooper as part of the lineup of moderators, which is one of its most diverse groups ever. The CNN anchor hosted a number of debates during primaries, as have out anchors Rachel Maddow of MSNBC and Don Lemon of CNN. But never before has an out LGBT person been given the role as surrogate for the American people in the critical general election. The moderator is charged with asking questions on behalf of the nation. Previous debates had been the territory of such mainstays as PBS’ Jim Lehrer and CBS’s Bob Schieffer. These are journalists trusted most for their fairness. Pauline Frederick of NPR was the first woman to moderate a presidential debate in 1976. Carole Simpson of ABC News was the first African-American in 1992. Then the country went two decades without another woman moderating a debate, with Candy Crowley of CNN in 2012. Other women, including Judy Woodruff and Gwen Ifill of PBS, had moderated vice presidential debates. An out LGBT person, however, has never served as moderator for a presidential or vice presidential debate in the general election. The first debate of 2016 will be September 26 in New York, moderated by Lester Holt of NBC News. Elaine Quijano will moderate the vice presidential debate on October 4 in Virginia. Holt is the first African-American anchor of a network nightly news program, and Quijano is Filipino-American. Then Cooper and co-moderator Martha Raddatz of ABC News will moderate a town-hall style debate on October 9 from Missouri. Half of the questions will be posed by uncommitted voters in the audience. The rules say candidates will get two minutes to answer, but that moderators could use one more minute to further the conversation. Topics up for discussion during the town hall are intended to be of broad public interest, according to the commission. So it's possible LGBT issues could be raised. The last debate of the season on October 19 in Nevada is moderated by Chris Wallace, the host of Fox News Sunday. He’s the first anchor from Fox News ever selected. All of the debates beging at 9 p.m. ET. "These journalists bring extensive experience to the job of moderating, and understand the importance of using expanded time periods effectively,” said co-chairs of commission, Frank J. Fahrenkopf, Jr. and Michael D. McCurry, in a statement. They added, “We are grateful for their willingness to moderate, and confident that the public will learn more about the candidates and the issues as a result."